Now includes free e-Book! What would a dental consultant say about your office? Is your schedule balanced, overtaxed or underutilized? Do your internal controls make would-be embezzlers think twice? Are your payment systems set up to maximize collections and reduce write-offs? How well do you control what people see when they Google your name or practice? Can you identify and successfully administer different dental benefit plans? 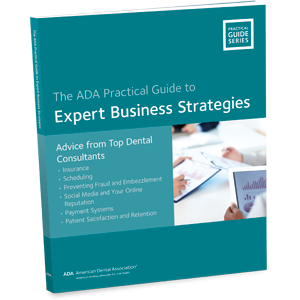 The ADA Practical Guide to Expert Business Strategies addresses these questions and more by tapping into the knowledge and experience of today’s leading dental experts, including Charles Blair, Susan Gunn, Cathy Jameson, Roger Levin, and Sally McKenzie. It is ideal for both dentists and office staff. Read the articles on your own, or use them as topics for staff meetings. The 100 chapter discussion questions will generate conversation and ideas for improving your practice – from patient care to your bottom line.